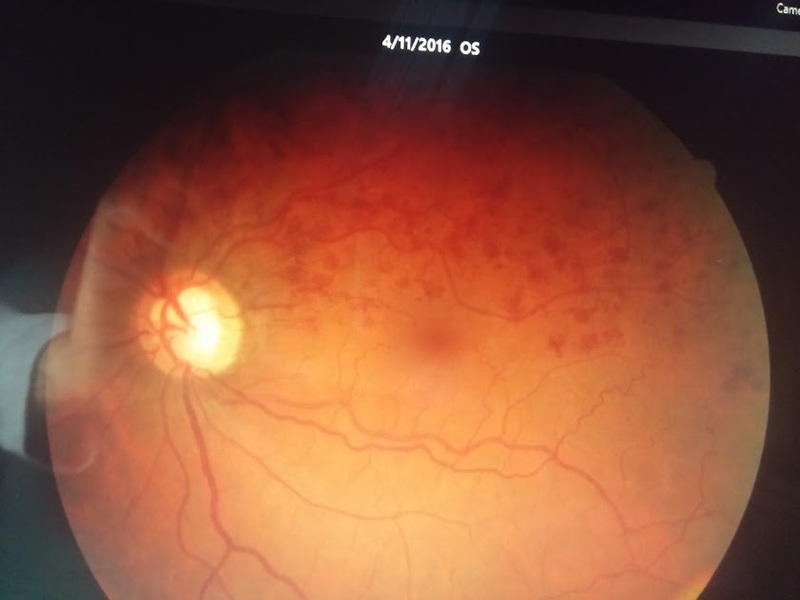 54 year old with NTG presents with blurred vision. Fundus exam revealed scattred hemorrhages in the superior temporal quadrant. What percentage of patients with this condition develop iris neovascularization? Is prophylactic laser treatment indicated in a patient with 6 DD of retina ischemia to prevent NVE? Approxiamtely 1% of patients with BRVO develop iris neovascularization. Prophylactic laser treatment is not indicated in a patient with 6 DD of retina ischemia to prevent NVE. The recommendation is to monitor teh patient for the development of NVE followed by laser. BVO presents with intraretinal hem, retinal edema and sometimes cotton wool spots in a sector of retina drained by the affected vein. Decreased vision is secondary to macular ischemia, CME, ME with hard exudates, sub retinal fibrosis and ERM. SCORE study: Intravitreal corticosteroids are equally effective as laser in reducing macular edema and improving vision by 3 lines. BRVO study: Intravitreal injection of ranibizumab improved vision in > 50% of patients with macular edema.